A few chosen tips to help you bake better and faster than you thought possible. You can tell if a cake or loaf is done if you stick a toothpick in the middle and it comes out clean. You can tell if muffins are done by lightly pressing them. If they spring back, they’re done. Bake a certain recipe often? Double the batch, allow to cool completely, place in airtight containers and freeze. Butter makes the best homemade piecrust, but shortening crusts can save you money. When making piecrust, don’t overwork the dough and keep your water and butter very cold to prevent the butter from melting. To make sure your butter is very cold while making piecrust, chop it into small pieces and place in the freezer for about an hour. To keep your water cold while making piecrust, simply keep a glass of ice water close and measure out the water as you need it. While rolling pie dough, be generous with the flour on your rolling pin, rolling surface and on your dough. It will make it easier to work with. If you don’t have quite enough crust to top all your pies, there’s nothing to worry about. Make a design or roll out the crust as far as it goes. It will still look wonderful and taste delicious. Have extra piecrust? Make into small shapes and top with cinnamon and sugar before baking. It’s delicious! If a recipe doesn’t specify egg size, you can assume you should use large eggs. Protect baking sheet: If your baking sheets become dark and crusted, line them with foil before baking and recycle when you’re done. Always preheat the oven before baking so that you can ensure even cooking. When a recipe calls for beating butter, the butter should be soft. Plan ahead and make sure the butter is at room temperature. For making pastry, hard cooking fats can be used straight from the freezer if grated into the flour. Use your judgment and experience when deciding whether you need to grease a pan or not. If you have high quality non-stick surfaces, it’s likely you don’t need to add any extra fat to your baking. Try an ice cream scooper to pour muffin batter into muffin pans. You’ll get just the right amount and fewer drips. Check cookies at the minimum baking time. Cookies are done as soon as they start browning around the edges. When baking most items, place the oven rack in the middle position. Don’t want your cake to stick to your the platter? Dust the platter with some icing sugar. If you want chewy cookies, use melted butter. If you like them more cake-like, use more eggs. A baker’s dozen is 13. Baking in 13s helps in arrangement and allows items to bake more evenly. For a shiny golden bread crust, brush your bread with an egg wash before baking. Make it by beating 1 egg and 1 tablespoon of milk. Uneven temperature in your oven? Rotate your cookies and other baked items part way through for more evenness. Want a nice steady supply of cookies? Most cookie dough is easily refrigerated or frozen. Most already baked cookies freeze well too. If you need a cake or iced cupcakes for a special occasion, but have a tight schedule, you can bake or freeze your cake or cupcakes ahead of time. Defrost and apply your frosting before the big event. Most frosting spreads best at room temperature, so plan ahead when you need to ice a cake. 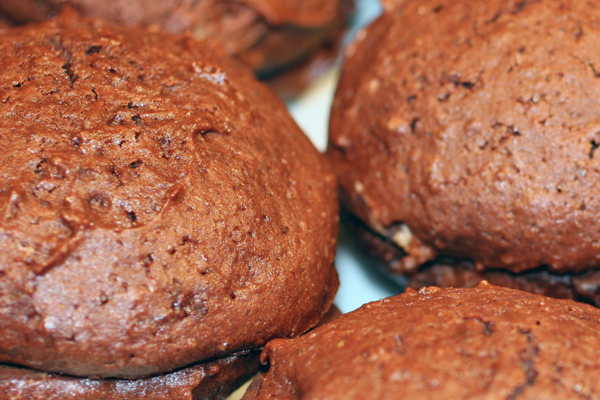 Give your baking a veggie boost: carrot muffins, chocolate zucchini loaf and pumpkin cookies. Peanut butter cookies taste divine with melted chocolate drizzled on them and hardened. Two great tastes in one. If you are baking cookies, using softened butter will make easier mixing. Butter should be softened just until it yields to light pressure so butter at room temperature is ideal. If you forgot to get the butter out of the refrigerator and it is still chilled, soften butter in the microwave on defrost - 30% power - for 10 to 20 seconds, depending the amount of butter to soften, then let stand and check. If necessary, microwave 5 to 10 seconds more, then let stand until ready to use. Cookies made with melted butter brown evenly and have a shiny surface but they are flatter and appear slightly cracked. Caookies made iwth cake flour will also brown evenly, and have a shiny, slightly surface but they will also be puffed, crispier, have good texture and appear more attractive. Cakes need to cool before being ready to handle or serve. Let them first cool in the pan a little, just a few minutes as cakes are left in pans too long will stick and be difficult to remove. A layer cake will need 5 minutes, a large bundt cake or a very moist one will need 10 to 15 minutes. You can start cooling a cake in its pan on a wire rack. After the initial cooling period, place a kitchen towel or waxed paper on the wire rack, invert wire rack over the top of cake, and then invert rack and cake. Shake gently to remove cake from pan and rest on rack until it is cooled completely. The towel, or waxed paper, will prevent wire indentations from marking the top of a cake as it finish cooling. For best results, cool cakes right side up. Cool cookies for 1 minute before removing from baking sheets and placing them on wire racks to cool completely. Cool brownies in pan on wire rack 20 minutes before serving. Cool your cake completely before frosting or your icing will melt! To frost a cake, use a pastry bag with different tips, use commercial frosting in tubes, or improvise by using a plastic bag with a corner snipped off. Thin frosting with milk to desired consistency, especially if spreading with a knife.